Keyboardist Patrick Cooper is known by his songs he composed for Marcus Johnson (Just Doing What I Do) and Jaared (Let It Happen). With his Portland, Oregon based band N-Touch he performed gigs around that area before he re-located to Washington, DC. He started his solo career with the album That Day (2007) showcasing sophisticated entertainment at its best. This album was re-issued in the following year as Vibin after adding two new tracks. Patrick now returns with his sophomore album The Way It Used To Be (2011). Like on his previous album he is joined by fellow musicians David Dyson (bass), Phillip "Doc" Martin (sax), Robert "WaWa" LeGrand (guitar), Tony Hemming (synth programming), and further artists Tommy Tordson (bass), Jay Williams (drums), Stanley Cooper (guitar), to name a few. In view of the fact that the rate of sale in music industry is constantly tumbling down, the question arises, if one should still invest much money in the recording of an album. It's less a question of economic reason, than the impetus to satisfy the audience, which motivated Patrick Cooper however to his second effort. On the grooving starter Struttn' Patrick expands his keyboard skills to everybody's pleasure. The relaxation of a lazy afternoon finds its worthy expression on Come Sunday. Patrick's sound image sparkles to the end with splashes of organ and piano. Cool, cooler, Next 2 U. This elegant song features Patrick's vocoderized vocals, Alvin White's fierce electric guitar and his coolness on piano. The Way It Used To Be walks straight to the roots of Funk and jazz. "When I look at the body of music created by artists like George Duke, The Crusaders and a myriad of other jazz greats that influence my work, it’s amazing how they were able to blend sounds and to work magic with the keys. That’s the sound and style I had in mind. I believe that the best music from our past forms the foundation from which the best music of today and tomorrow emerges,” Cooper stated. I'm That Man presents a vocal chorus by Nehemiah Booker, who serves a big dose of R&B to the album. Side Steppn' is a popular title in the smooth jazz world, used by Marcus Johnson, Paul Brown or Darren Rahn. Patrick adds his personal musical interpretation of this term shining anew on his favorite instrument. Denise is something for the heart. Slow, emotional and complex. Take Patrick's advice It's Ok To Move seriously. This is your song for the dance floor. 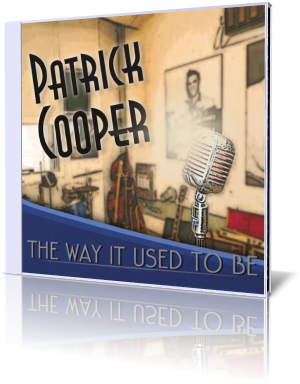 Patrick Cooper's The Way It Used To Be is a magic collection of songs. Not just a pure retrospective to jazz and funk of the past, but a modern variation of contemporary jazz made-to-measure for all music aficionados.